Shaenon: The Narbonic Victorian story–now available in print!–has some pages of odd lengths, so to fill out the space in the print version I drew period advertisements. Here’s one that crosses over with Skin Horse. Channing: Man, I have tinkered so much with Shaenon’s canon over the years. This is delightful to see, regardless. So exactly how many generations of Professors Lupin Madblood have there been? And have each of them been mortal enemies of the generations of Helen Narbon? We want information … information … information! Though walking seems not possible with treads, that Time Wasters Will Be Ground Beneath Steel Treads has decided me that silence on this occasion is wise, and there will be no complaint on the accuracy of the advertisement on my part at this time. Perhaps in a thousand years, should my pedantic attention to this detail survive so long. Can’t quite tell what that is along his side. A tentacle? Exposed clockworks? Air holes for the bees? (Wait, no, wrong rampaging robot). Wasn’t Moustachio created by *Ximes* Madblood? Could have done it based on Lupin’s designs, maybe. The question made me go look it up. The comic indeed references a “Madblood, Count Ximes”. And the comments under that strip mention that Lupin’s father was named Felix Madblood. 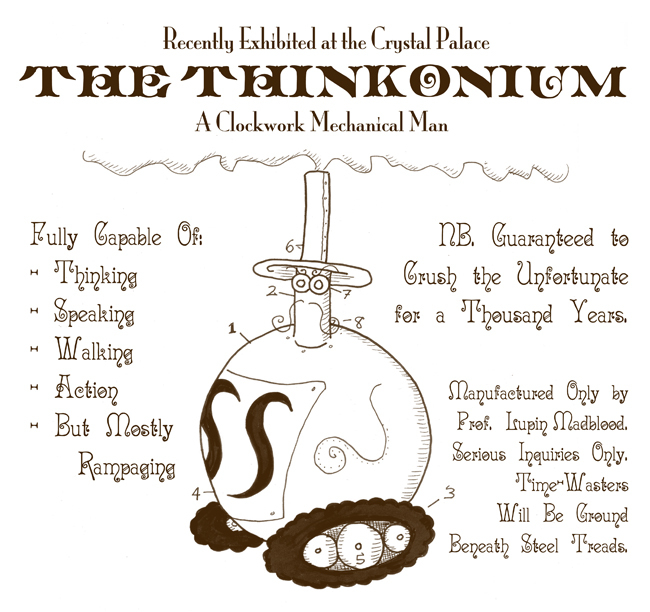 So perhaps the Lupin we know (and love) was advertising The Thinkonium based on his great-great-(great? )-grandfather’s designs. Or perhaps Ximes’ father was also named Lupin, and he had originally designed The Thinkonium. This also answers my question above. It would seem there have not, in fact, been several generations of Lupin Madbloods (unlike Helen Narbon, who has apparently duplicated herself for several generations), but apparently there have been several generations of Madbloods who have all been Mad roboticists. Maybe Shaenon can shed some light on the subject? I think maybe I may have terminally broken Shaenon’s inner canon and now maybe neither of us is an authority. Great… nice going. Turned the canon against yourselves, eh? Hoisted on your own petard, as it were. Then again, if one of you states something as canon, we’d probably believe it (y’know, unless it’s glaringly contradictory or something). The comments there (including one from Jeff) point out that Ximes was his title rather than his name, so it all works out after all. And it may have been that our Lupin’s father was only CALLED Felix, but maybe it was his middle name, and his first name actually was Lupin as well.